As a kid, I remember going to a local restaurant called King Gyros. They had burgers, hot dogs, fries, and typical American fare, but, as the name indicates, they were known for their gyros, and those are what we always ordered. 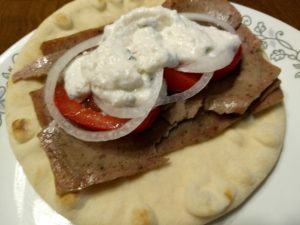 Gyros remain a real treat for me: thick pita bread stuffed with seasoned meat shaved off of a spit, drizzled with a flavorful white sauce, and with lots of sliced onions and tomatoes tucked in. Sometimes I see gyros kits for sale at traditional grocery stores, but I’m usually disappointed. They almost never taste like what I get at restaurants. I’ve also tried making them at home in my slow cooker using a recipe that called for beef, and while it was a good meal, they weren’t authentic gyros. Then Aldi introduced the Bremer Gyros Complete Sandwich Kit. These taste like restaurant gyros. Really. Aldi has been selling this gyros kit for several years. It’s a semi-annual ALDI Find (Special Buy), which means it shows up several times a year. In our experience, it seems to find its way into the ALDI Finds freezer every few months or so, so if you miss it, you won’t have to wait as long for it to come back as some ALDI Finds. That doesn’t stop me from stocking up when they show up, though. Aldi’s gyros kit contains enough to make five sandwiches. This includes 16 oz. 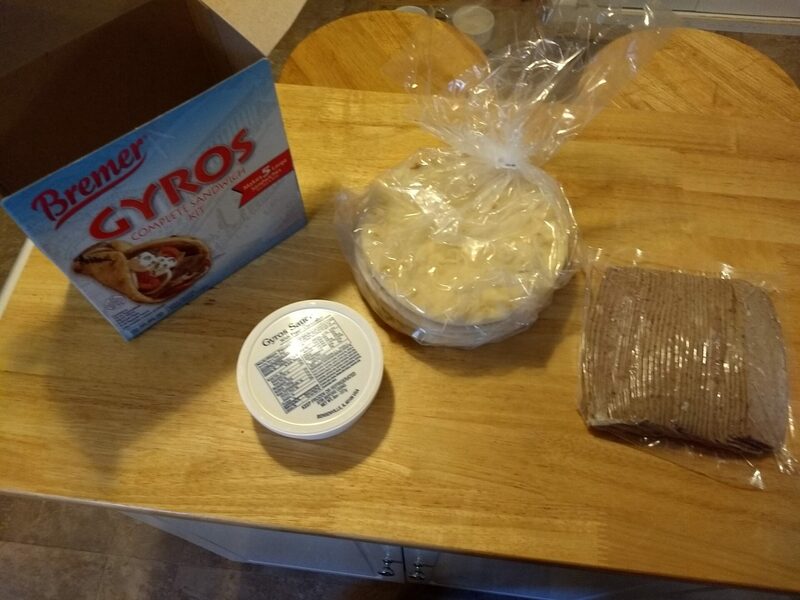 of precooked gyros meat slices, 5 Greek pitas, and 8 oz. of Tzatziki sauce. The sandwiches are large, and the kit contains a generous amount of meat and sauce. I usually put a little more than the recommended serving size of meat (six slices) on my sandwiches because there is plenty to go around. The kit is sold frozen, so you’ll need to thaw it overnight in your refrigerator before eating. 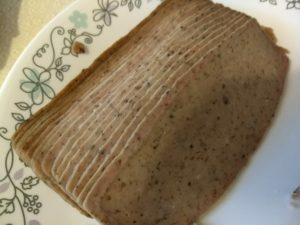 Sometimes I have a little trouble separating the meat slices to remove them from the packaging, especially if I’ve cut thawing time a little short. The meat breaks apart and crumbles when I try to separate it if it isn’t fully thawed. If the meat is still semi frozen when you go to prepare your gyros, defrost the meat slices in the microwave for a minute or two. Once they’re somewhat warmer, they’ll separate more easily. You have two methods for preparing your gyros: skillet or microwave. I’ve used both methods and they work equally well with fairly identical results. The last time I made these gyros, I used the microwave because it was a bit more convenient. To prepare using the skillet method, heat the pita bread on medium heat until it’s warm and soft, for about 30 to 45 seconds per side. You can lightly brush both sides of the bread with vegetable oil or cooking spray before heating if you want it golden brown (I never do this). Then heat the meat slices on medium heat for 15 to 20 seconds per side. Because the meat is precooked, avoid overheating and drying it out. Because the slices take such a short amount of time to heat, you have to keep an eye on them and be quick. It’s easy to get distracted and lose track of how long the meat has been in the skillet, and I’ve overheated it before, and it gets hard and chewy. Not what you want. To prepare the gyros using the microwave method, heat the bread for 15 seconds or until it’s warm and soft. Then microwave six slices of meat (a single serving) on a microwave-safe dish covered with a paper towel for about 30 to 45 seconds or until warm. For more than six slices of meat, add 15 seconds to cooking time per additional serving. The benefit to the microwave method is that you’re less likely to overheat the meat. To serve, place one pita bread flat on a plate and add six slices of warmed meat. Spoon 1 to 2 tablespoons (I add more!) of Tzatziki sauce on top of the meat. Garnish with thin tomato wedges and sliced onion. Tomatoes and onions are essential components to gyros, but they aren’t included in the kit, so don’t forget to buy them when you buy the kit. 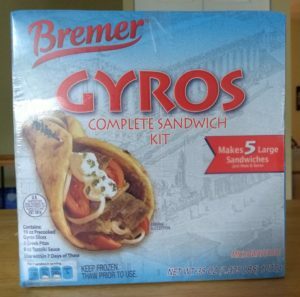 Aldi’s ALDI Find (Special Buy) Bremer Gyros Complete Sandwich Kit is the real deal. These gyros taste like what you’d get at a restaurant, and you get a box of five gyros for the price you’d pay for a single one at a restaurant. Highly recommended. I’ve tried this,too and your review is spot on! The only thing is sometimes I want the “Gyros platter” so I get some Greek olives and feta cheese to make it special…and maybe some of those RIchway french fries my favorite local restaurant serves with their Gyros special. Yum!